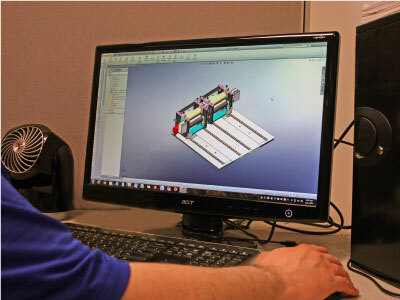 GSS uses 3D solid modeling design software to provide the most cost effective means to develop new products. The 3D views are the primary communication vehicle between the designer and the customer as the project progresses through the development cycle. The 3D modeling is the most accurate means to assure the product will be assembled as the designer intended. 3D modeling allows for Finite Element Analysis to be performed as well as 3D animation to be developed to provide our customers a even higher level of confidence that the product will perform as indented. A proper 3D model can either propel or delay a product to final manufacturing as well as reduce changes after manufacturing. We can design using either Metric or English units utilizing geometric tolerances. GSS utilizes 3D software from Solid Works, Solid Edge or AutoCad.